Senai International Airport or Sultan Ismail International Airport is the airport serving Johor Bahru, close to the border with Singapore. It is mostly a domestic airport with few international flights although there are plans to increase this dramatically and to attract more people from Singapore. Distance from city center: 25 km. Which airlines fly to Senai International Airport? How many runways and passenger terminals does Senai International Airport have? Senai Airport has a capacity of up to 4.5 million passengers a year. Recently the airport was upgraded and the runway was extended to 3800 meter. Also, the terminal was completed with an Aero Mall, a large shopping complex. Since 2009 the airport provides free WiFi for all customers at the main Terminal. Where is Senai International Airport located? Senai International Airport is located about 25 km north of central Johor (roughly 40 minutes by car). How to get from the airport to Johor Bahru city centre by public transport? From the airport two buses depart to Johor Baru. The Airport Shuttle Bus (Causeway Link white bus) to JB Sentral and Causeway Link Bus No 333 to Larkin Bus Terminal. These two buses depart from different spots at the terminal so watch the signage. The Airport shuttle bus costs RM 8.00. The direct Malaysian Airlines express bus to and from the airport to Singapore was cancelled and now you need to go to Larkin Bus Terminal first, and there transfer to another bus. See for tickets and schedule: buses: causewaylink.com.my . How much does a taxi cost from the airport to Johor Bahru city centre? Taxis are widely available at the airport and use a voucher system and fixed prices. At the taxi desk tell your destination to the airport staff and they will tell you the price, after paying you will receive a voucher which you need to show to the taxi driver. 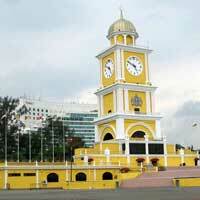 Expect to pay Rm 45 for a trip into Johor Baru center. What are popular destinations from Senai International Airport? Scores on a ten-point scaled. Based on 5 ratings. Need place to stay in Johor Bahru?